Checking in with the contestants of the 3rd Annual Philly Chili Bowl. Info, stats and predictions. HEAT: This chili is more about flavor than about heat. I am a hot sauce freak, but this dish has a relatively low level of spiciness. 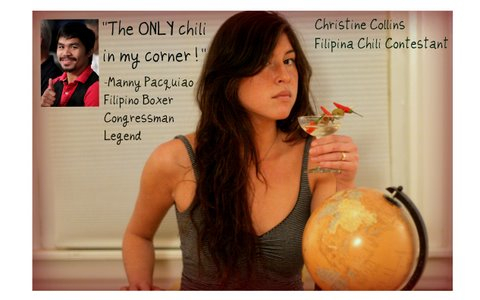 CHILI PROFILE: We don’t actually make chili in the Philippines. My grandmother’s original version was basically boiled hot dogs with ketchup and sugar over rice. My mom had to update that recipe because she ended up marrying an American (my dad) who loved USA style, meaning, well, no hot dogs. The chili today is a mixture of my mom’s recipe and mine. Over the years I have been incorporating Filipino street food to the dish, while also keeping many traditional American elements. I think my chili is a mix of things; a little savory, a little sweet, a little crunchy and a little spicy, basically a Filipino/American combo…just like me! PREDICTION: If all goes well, I will have a Naragansett in my right hand and my chili scooping spoon in my left. After a few hours of serving my chili, I predict I will want to sit down. The judges will start announcing the winners: 3rd…2nd… and then… 1st place! My name won’t be called. It’s okay though. I take it in stride and reach over for another beer. But then, dramatically, Philly BigBites judge Joe Bernstein stands up and shouts, “There has been a miscount my dear friends!”. Someone had apparently spilled a potent mixture of Tabasco and Blackberry brandy over half of the ballots, making them illegible…until now! With the votes re-tallied, it turns out I have tied for first! My fellow first-placer and I jump for joy! We stand to meet, nose to nose, and shake hands, knowing this is a friendship for life. This entry was posted on Wednesday, February 15th, 2012 at 11:19 am	and posted in Chili Check-In, Philly Chili Bowls. You can follow any responses to this entry through the RSS 2.0 feed.